Een prachtig mooi artikel in the New York Times. Voor de mensen die geen kieuwen hebben. 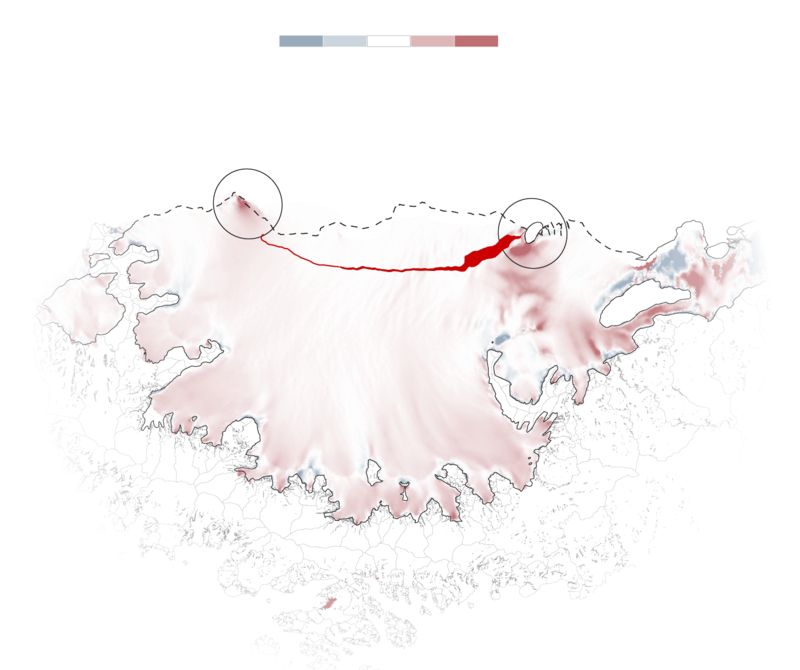 NYT: A Crack in an Antarctic Ice Shelf Is 8 Miles From Creating an Iceberg the Size of Delaware. A rapidly advancing crack in Antarctica’s fourth-largest ice shelf is getting close to a full break, according to scientists. It has accelerated this year in an area already threatened by warming temperatures, and is now only about eight miles from the edge of the ice shelf. En die Paris Accords dan? Die hebben we toch netjes getekend? Maar dat helpt dus godverdomme niet? The crack in Larsen C is more than 120 miles long, and some parts of it are as wide as two miles. Once the crack reaches all the way across the ice shelf, it will create one of the largest icebergs ever recorded, according to Project Midas, a research team from Swansea University and Aberystwyth University that has been monitoring the rift since 2014. Because of the amount of stress the crack is placing on the remaining eight miles of the shelf, the team expects the break to happen soon. Als ik ijs was in Antarctica zou ik ook vreselijk gestresst zijn.